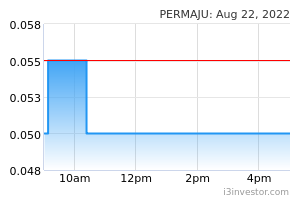 Permaju Industries Bhd is Malaysia-based investment holding firm. The company is primarily engaged in sales and distribution of automobile vehicles. The company operates in four business segments namely; Timber segment comprises of sale of timber logs and related timber products and holding of timber concession and tree plantation; Automobile comprises of sale and distribution of motor vehicles and provision of related services which also contributes a major part of revenue; Property segment consists of development and construction of property, and Other segment involved in group level corporate services and investment holding activity. Most of its revenue comes from the Malaysian market. Tnecera Prime is it today? capayam2018 mggu dpn kemungkinan 0.5 angpa msk sendiri bayar...hahaha. Hariz Azman Ready to fly soon. Woo Kok Keong Is coming is coming!¡!!!! stocking look at the upward trending, slow and steady with respectable vol. Donald788 Any reason to support tp @ 1.00? Tbt95 What price will it go highest? HiddenDragon has it reached the expected top? prince4 After change government economy no good markets uncertain ,funds manager and foreign funds selling.. money would not flow in fundamental big cap and mid cap stock now no prospects because everybody scare buy high losses money ,expect fund manager money would flow out in big and mid cap stock cannot hold and buy. TOP volume all low prices stocks. PN17 company cannot buy , just buy cash rich company.This is a opportunity ,markets money now flows in cheaper stocks. sharks now start goreng lows price stock at bottom..